Introduction to soil degradation | Infonet Biovision Home. Erosion form overgrazed communal land: gully and sheet. 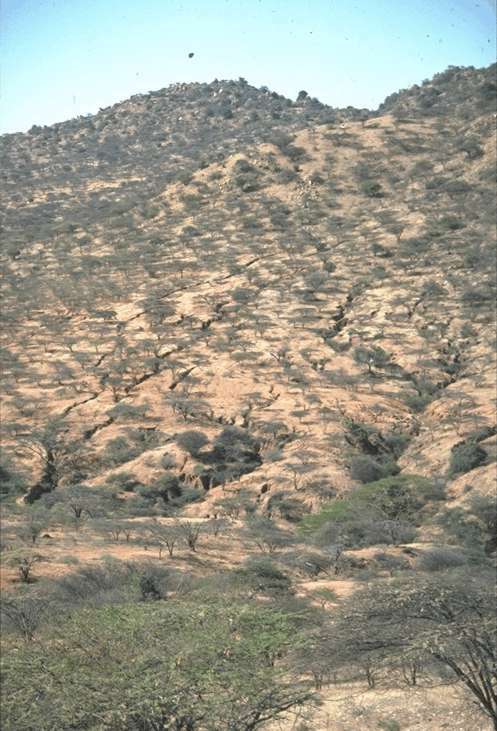 Even with good tree bush cover, erosion is high (Kenya). Description: This datasheet describes shortly the main types, properties and causes of soil degradation and gives an overview of possible countermeasures. Soil degradation is a global process, but sub-Saharan Africa is affected most, with arid and semi-arid zones being particularly affected. Depletion of nutrients and soil organic matter and erosion are the principal forms of soil degradation. Overgrazing and cultivation practices that are not adapted to local environments are the principal causes of soil degradation. Overgrazing is often the result of the loss of pastures to agriculture. Producing crops without compensating the nutrient losses by removing plants also leads to soil degradation. The most prominent degradation feature worldwide is erosion by water. Various forms of chemical deterioration, such as soil fertility decline and soil pollution, and physical deterioration, such as compaction and water logging, account for smaller areas (Oldemann et al., 1990). The main impact of soil erosion is the reduction in soil quality which results from the loss of the nutrient-rich and fertile upper layers of the soil, and the reduced water-holding capacity of many eroded soils. In other words, 'Erosion removes the cream of the soil' (soilerosion.net). 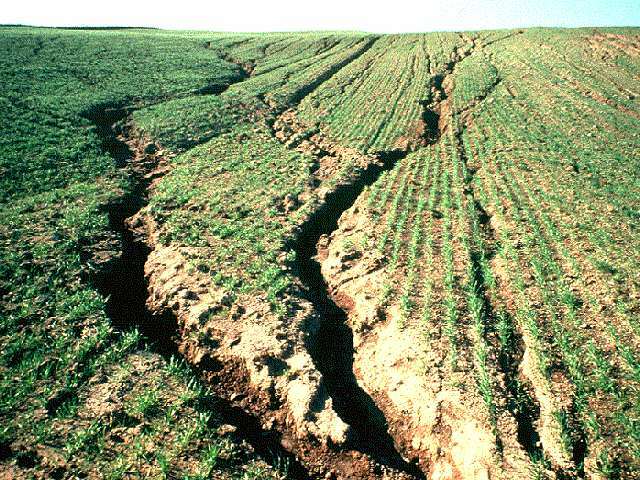 Therefore soil erosion is one of the most serious threats to soil fertility. Even low erosion rates which are almost invisible can over the years have a severe impact on soils. It is therefore of vital importance to protect the soil from erosion. Especially organic farming fully depends on maintaining the natural fertility of the soil. 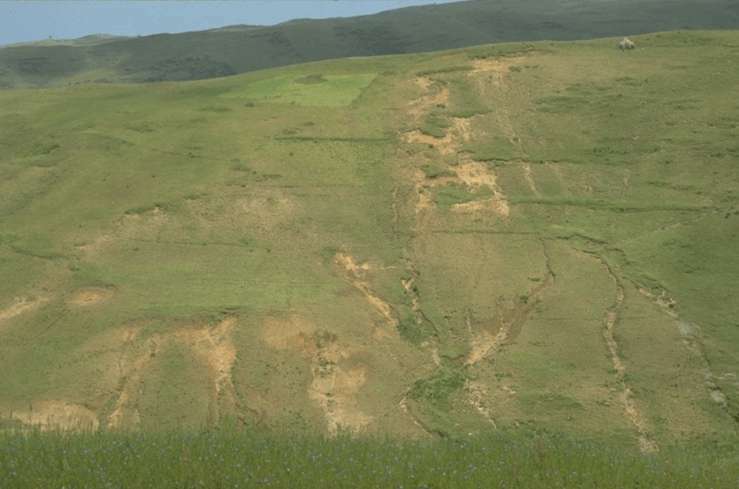 Soil erosion - Large rills on an eroding hill slope. Soil erosion describes the process of soil particles carried away by water or wind. Soil erosion can lead to unproductivity of the respective soil and, thus, render the soil unusable for agricultural production. Erosion is strongly related to human activity. Soil erodibility is an estimate of the ability of soils to resist erosion, based on the physical characteristics of each soil. Generally, soils with faster infiltration rates, higher levels of organic matter and improved soil structure have a greater resistance to erosion. Sand, sandy loam and loam textured soils tend to be less erodible than silt, very fine sand, and certain clay textured soils. Slope Gradient and Length: Naturally, the steeper the slope of a field, the greater the amount of soil loss from erosion by water. 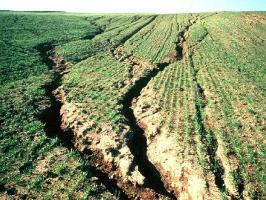 Soil erosion by water also increases as the slope length increases due to the greater accumulation of runoff. Vegetation: Plant and residue cover protects the soil from raindrop impact and splash, tends to slow down the movement of surface runoff and allows excess surface water to infiltrate. 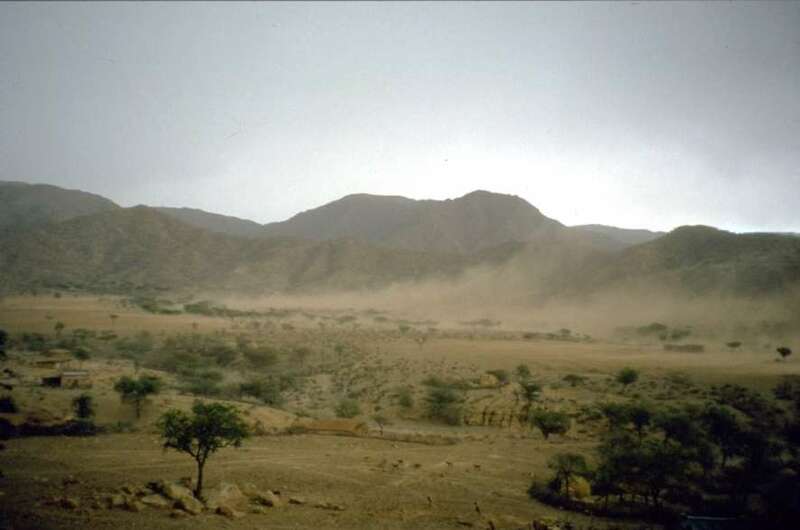 Erodibility of Soil: Very fine particles can be suspended by the wind and then transported great distances. Fine and medium size particles can be lifted and deposited, while coarse particles can be blown along the surface (commonly known as the siltation effect). Soil Surface Roughness: Soil surfaces that are not rough or ridged offer little resistance to the wind. Excess tillage can contribute to soil structure breakdown and increased erosion. 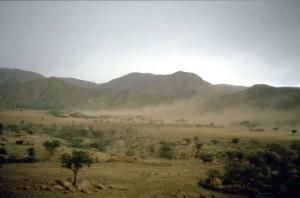 Climate: The speed and duration of the wind have direct relationship to the extent of soil erosion. Soil moisture levels can be very low at the surface during periods of drought, thus releasing the particles for transport by wind. Unsheltered Distance: The lack of windbreaks (trees, shrubs, residue, etc.) allows the wind to put soil particles into motion for greater distances thus increasing the abrasion and soil erosion. Knolls are usually exposed and suffer the most. Vegetative Cover: The lack of permanent vegetation cover in certain locations has resulted in extensive erosion by wind. Loose, dry, bare soil is the most susceptible. The most effective vegetative cover for protection should include an adequate network of living windbreaks combined with good tillage, residue management, and crop selection. Chemical deterioration involves loss of nutrients or organic matter, salinisation, acidification, soil pollution, and fertility decline. The removal of nutrients reduces the capacity of soils to support plant growth and crop production and causes acidification. In arid and semi-arid areas problems due to accumulation of salts can arise, which impedes the entry of water in plant roots. Soil toxicity can be brought about in a number of ways, but typical examples are from municipal or industrial wastes, oil spills, the excessive use of fertilizer, herbicides and insecticides, or the release of radioactive materials and acidification by airborne pollutants. While soil toxicity may be a relatively minor problem at present in Africa, it is likely to become of increasing importance in future years (Land and Plant Nutrition Management Service, 2002). Physical deterioration involves soil crusting, sealing and compaction and can be caused by several factors like compaction through heavy machines or animals. It occurs in all continents, under nearly all climates and soil physical conditions. Soil crusting and compaction tend to increase runoff, decrease the infiltration of water into the soil, prevent or inhibit plant growth and leave the surface bare and subject to other forms of degradation. Severe crusting of the soil surface because of breakdown of soil aggregates can inhibit water entry into the soil and prevent seedling emergence (Land and Plant Nutrition Management Service, 2002). Certain conservation measures can reduce soil erosion. Soil / land management practices such as tillage and cropping practices, directly affect the overall soil erosion problem and solutions on a farm. When crop rotations or changing tillage practices are not enough to control erosion on a field, a combination of measures might be necessary. For example, contour plowing, strip cropping, or terracing may be considered. For more examples and description of the conservation measures refer to coming sections. Oldeman L.R., Hakkeling R.T.A., Sombroek W.G. (1990) World map of the status of human induced soil degradation. An explanatory note. International Soil Reference and Information Centre, Wageningen, The Netherlands. WOCAT, 2007. where the land is greener - case studies and analysis of soil and water conservation initiatives worldwide. Editors H.P. Liniger and W. Critchley. CTA, FAO, UNEP and CDE, University of Bern.